Last quarter, the Newseum Institute’s First Amendment Center launched a “report card” to evaluate the state of each of the five freedoms of the First Amendment in the age of Donald Trump. The first report card was released in April 2017. For our second report card, we brought back the same panel of 15 First Amendment experts — academics, lawyers, journalists and activists from across the political spectrum — and asked them to update their grades and provide their commentary. 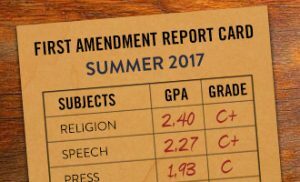 The composite grade point average for the five freedoms of the First Amendment this quarter was a 2.41 — a C+. This is the same grade the First Amendment received last quarter. Grades for each of the five freedoms also remained consistent. Freedom of religion and freedom of speech received C+ grades, freedom of the press received a C grade, and freedom of assembly and freedom to petition received B- grades. At first glance, it may seem that nothing has changed. But a closer look reveals that a great deal has impacted our First Amendment freedoms in the past three months. While many of the overall threats to and opportunities for the First Amendment remained the same this quarter, the numerous events of the past three months affected the way our panelists graded our freedoms. The repeated blocking of the Trump administration’s travel ban in federal courts, the recent Supreme Court decisions impacting freedom of speech and freedom of religion, and the sharp uptick in assaults against journalists were all frequently cited in our panelists’ comments, and bore most of the responsibility for the shifts in grade point averages. On the whole, our panelists saw improvements in the freedoms of religion and assembly this quarter, but expressed concern over possible deterioration in the freedoms of speech and the press. The next First Amendment report card will be released in October 2017. Even when the changes to these grades appear minute, it’s important to remain vigilant to threats to these five core freedoms that we are often too apt to take for granted. This entry was posted in First Amendment News, News and tagged First Amendment report card by Lata Nott. Bookmark the permalink.